Home › Updates › Thanks for a Great Season! This Friday, September 26, we’ll close out the Tilton Farmers’ Market summer season with a gloriously beautiful, early fall day, lots of farm-fresh goodies, local tunes and friendly faces. What a wonderful season it’s been! We were honored last month to be chosen by Governor Maggie Hassan as a site to sign into law New Hampshire’s new farm to plate legislation, and to generally acknowledge the value farmers’ markets bring to the state. 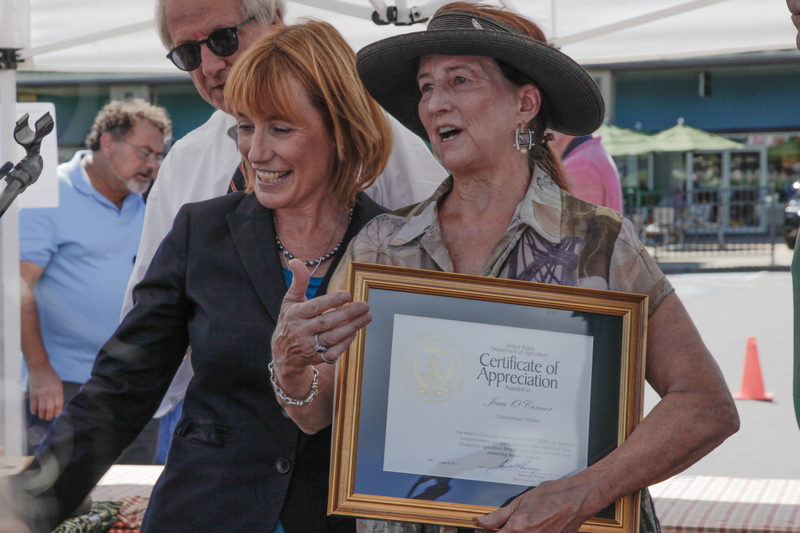 At the same time, Market Manager Joan O’Connor was presented with a United States Department of Agriculture Certificate of Appreciation for her years of work in support of New Hampshire farmers markets. Wow! What an honor! Congratulations, again, Joan! Many, many thanks to our fine vendors, loyal customers and many friends of the market for making this such a successful season. Special thanks to Grace Cohen, Mike Munhall and Dawn Forde for their help with all kinds of things this summer, as well as market helpers Michael Caplan and Garrison Gage. Many hands made for light work! This effort doesn’t stop just because it’s the end of September. We’re rolling along full steam, planning for the ever-popular Tilton Winter Farmers’ Market, set to open on Saturday, December 13. But first—don’t miss the last SUMMER market of the season! We’ll be here, sending summer away in style, Friday, September 26, 3 to 7 at the Tanger Outlets. See you at the market! ‹ Perfect Fall-Like Day for a Farmers’ Market!